From 1967-1979, Edward W Brooke III was the first [in modern times] black United States Senator from Massachusetts. Now, Tim Scott of South Carolina will be the only black United States Senator at the present time. What do both of these black men have in common? They are both Republicans. I detest identity politics, but I think this is noteworthy to point out. I am proud as a Republican that the first black man and now the only black man in the United States Senate are [were] both from the party of Abraham Lincoln. 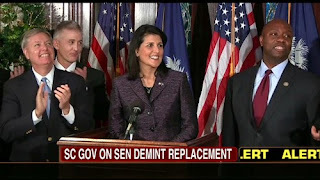 This from Townhall.com 's Guy P Benson [who is also a frequent contributor and guest host of the Hugh Hewitt radio show]: "Gov Nikki Haley of South Carolina has chosen Representative Tim Scott to replace Jim Demint in the United States Senate..." "The move will make Mr. Scott the first black senator from the south since the late 19th century." 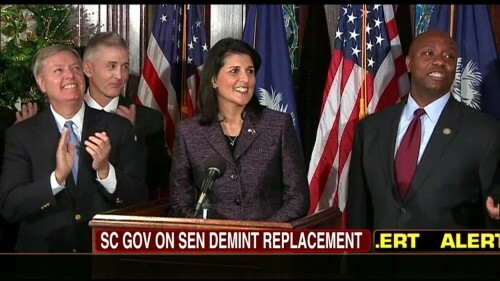 Thank you Governor Haley for making a great choice. Tim Scott is a principled straight talking conservative who will do a great job as United States senator in my opinion. I think he is the perfect choice to replace Jim Demint. In making the announcement, Gov Haley said: "What I will tell you, and it is important to me as a minority female-that congressman Scott earned this seat." God Bless you Governor Nikki Haley and newly named senator Tim Scott! I believe Tim Scott will make South Carolina and America proud.